We believe in sustainable practices that promote conservation of the environment. Both our olive tree crops and our EVOO are organic. Our first organic certificate is from the CCPAE (Catalan Council of Ecological Agricultural Production), the institution that endorses and controls our olive production. In addition, our oil mill located in Calaceite (Province of Teruel – Region of Aragon) is certified as an organic facility by CAAE (Aragones Committee for Ecological Agriculture) guaranteeing that both olives and oil production meet international standards of organic production. 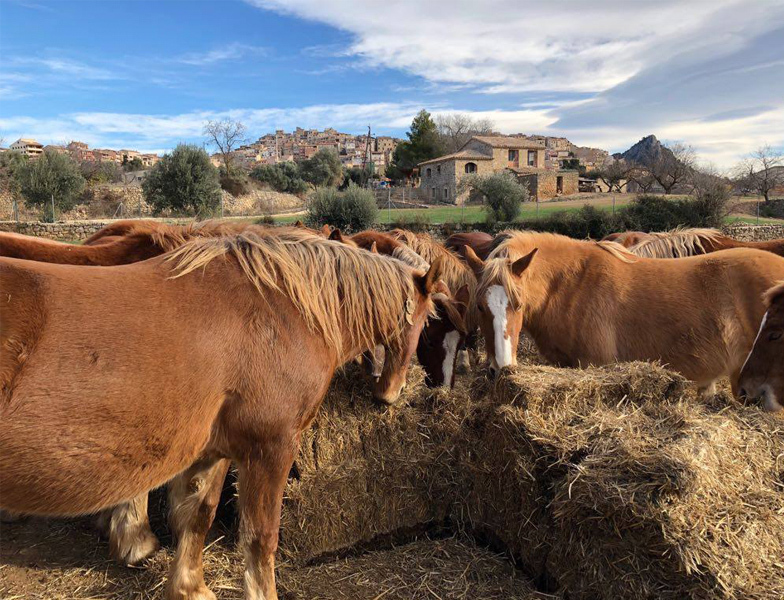 Among other agriculture ecological methods, we use Pyrenees horses to control unwanted herbs and weeds without the use of herbicides minimizing machinery use and fossil fuels. We are currently exploring other resources that contribute to the enrichment of the ecosystem and to the quality, flavor, and fragrance of our oils such as installation of beehives to improve pollination and the use of aromatic plants to control pests. These initiatives in addition to the conservation of forests surrounding our olive groves highlight our commitment to the environment and to the amazing territory where we are located that was declared a Biosphere Reserve by UNESCO in 2013.